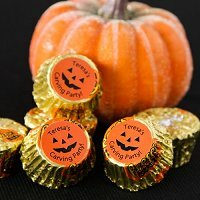 For one-of-a-kind party treats made just for you, look no further than personalized Halloween party mint chocolate candy. Take your pick of candy colors, icons, fonts and printing options—personalize one side of each delicious, round candy with a special message. 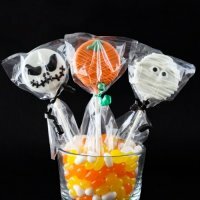 Treat your guests to these tasty personalized Halloween lollipops. With many designs and colors to choose from, you're sure to find a unique style to suit your occasion. 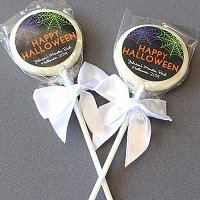 Lollipops are wrapped in clear cellophane with a white satin bow tied around the stick. Add a sweet touch to your Halloween party with personalized Hershey's Miniatures. These mini candy bars come in an assortment of milk Chocolate, crackle, and special dark. 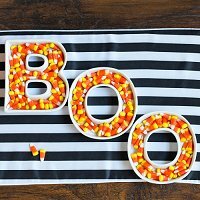 Choose from eight spooktacular designs, and then enter personalized text to make these treats even more memorable. 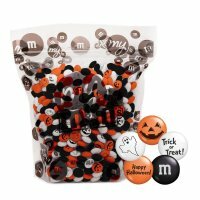 Celebrate the spookiest time of year with this scary-fun bag of Halloween M&M'S®. 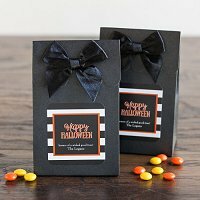 These custom chocolate candy feature the holiday's classic colors of black, orange and white and are printed with Halloween-themed clip-art, including a ghost, jack-o'-lantern, "Happy Halloween" and "Trick or Treat!" messages. 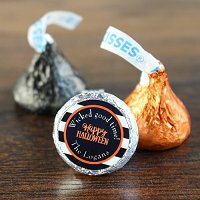 Add even more sweetness to your Halloween party with these personalized Hershey's chocolate Kisses! 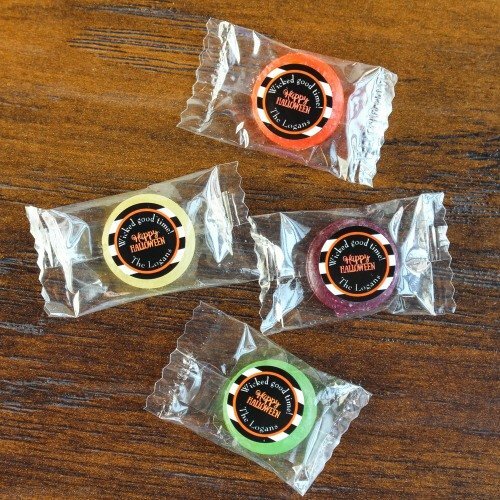 These bite-sized sweet treats come with their own individual labels in the design of your choosing. Simply select your favorite style, input your name and event date or special message to guests. The perfect blend of peanut butter and creamy milk chocolate, our personalized Hershey's Reese's favors are ideal for any haunted holiday celebration. 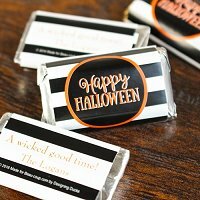 Choose from eight spooktacular designs, and then enter personalized text to make these treats even more memorable. Every trick-or-treater loves the house in the neighborhood with the best candy bars. 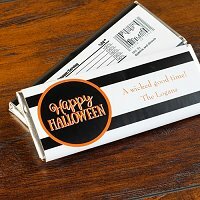 So at your Halloween party, make your home the best in town and give these personalized Halloween Hershey's chocolate bars in your choice of spooky Halloween designs. Give guests something to "mmm" about at your next Halloween party thanks to these chocolate covered Oreo cookie pops! These individually decorated cookies are wrapped in cello bags and finished with a curled and colored ribbon. 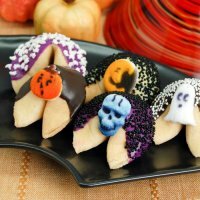 These fun little treats are tasty and festive and will instantly add an air of celebration to your Halloween party. These personalized Life Savers come in peppermint or assorted fruit flavors. 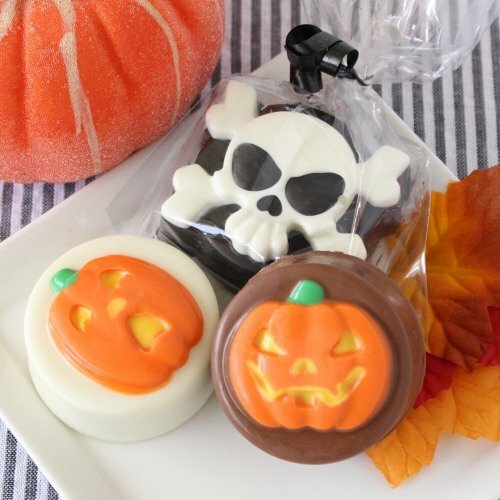 Dipped in white chocolate and fashioned into the shape of a variety of designs, these custom chocolate covered Oreo cookies are the perfect addition to a Halloween dessert display. Serve them as party snacks or send them home with guests as favours. Made from the finest ingredients, each crunchy cookie is hand-dipped in chocolate and decorated with tiny sprinkles or an edible Halloween-themed decoration. You can customize the colors of both the chocolate base and the decoration. Best of all, a custom fortune is tucked inside each! 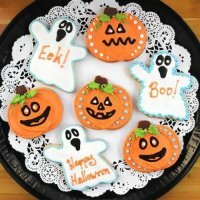 Made from a classic butter cookie recipe with a touch of almond, guests of all ages will love these cute and delectable treats at your Halloween party. 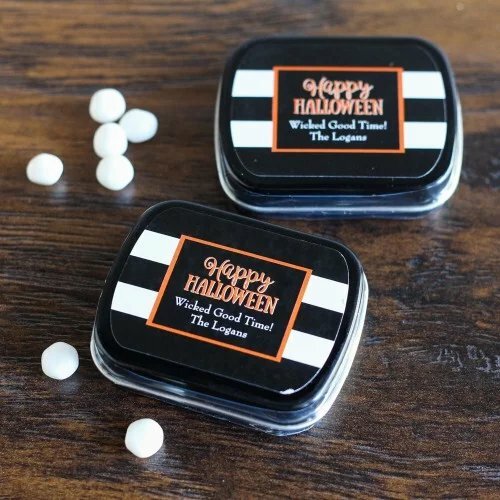 These personalized mint tins make great Halloween party favors and are custom printed just for you. Palm sized tins come in either black or white. 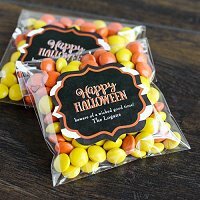 Oven-fresh chocolate chip cookies, just-sliced cake, or candy — whatever the treat, take it to go with these personalized party sweets 'n treats for Halloween. 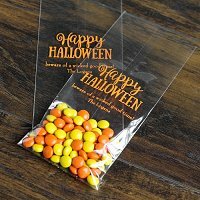 Personalized party cellophane bags are elegantly clear, making them a perfect match for any Halloween themed party or event. Small things come in great packages! 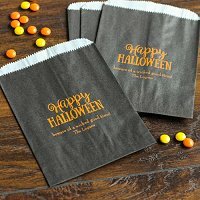 Even the tiniest candy treats make a big impact when given in these chic personalized Halloween candy bags, available in a variety of sweet designs. 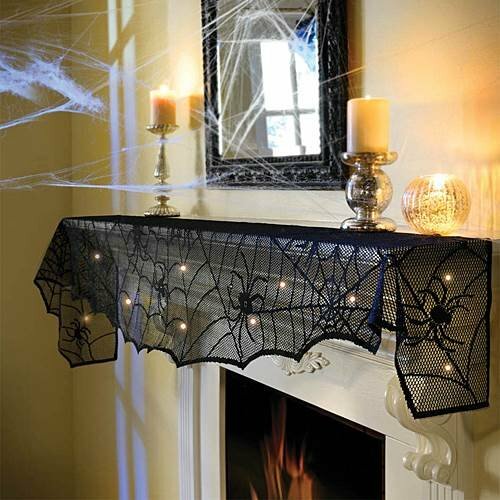 For your Halloween party, these handy clear candy bags are the perfect favour bags. Personalize with your color, design, and special message selection for a unique favour. Try filling with candy to match your party décor whatever the occasion may be! 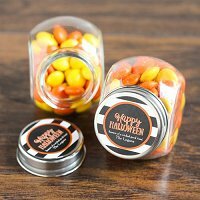 These personalized candy jars are the perfect favour or gift for guests at your Halloween event. 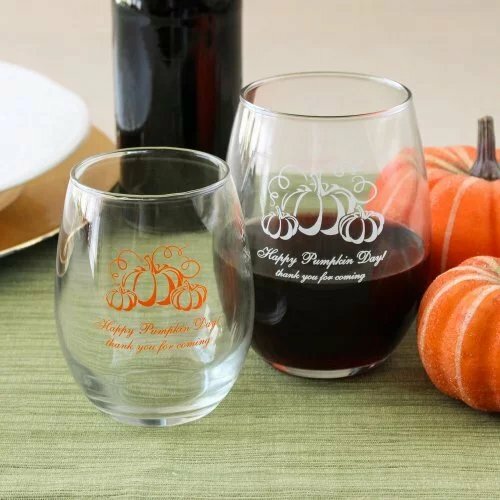 Simply slip some goodies inside each jar and cap it off with the custom-printed label on the lid. 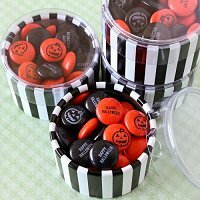 Each reusable mini candy jar comes with a metal screw-on lid and your choice of personalized labels. These ceramic character dishes give you creative license when serving up delicious treats at your upcoming Halloween party. Choose any variation to spell out names, initials, well-wishes, whatever! Just have fun with the creative opportunities. Ooops! This naughty witch fell into the cauldron while trying to steal the candy that was inside the pinata! Go away naughty witch, the candy is only for the kids. 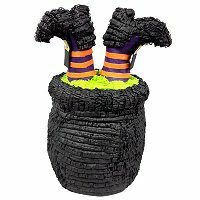 This Naughty Witch matches any Halloween party theme and you can rest assured that your guests will have a blast with this super fun pinata! This pinata can be used as centerpiece decoration or just fill with candy and toys and play the traditional party game! Sneak a Peek!